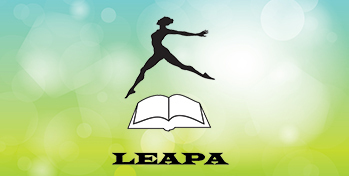 The Luxembourg European Association for the Performing Arts or LEAPA is a Luxembourg-based club, founded in 2014, to bring together multinational and multicultural people to appreciate or take part in all kinds of performing arts events. It is a section of the Cultural Circle of the European Institutions in Luxembourg. The club encourages those with a passion for the performing arts to socialise and enjoy a variety of predominately English-language cultural events and performing arts, including its own or others’ productions. Members meet on the last Monday of every month (except in July, August, and December) at the European Foyer in Luxembourg City (10 Rue Heinrich Heine, 1720 Luxembourg) and, depending on what's on, for other activities that can range from viewing plays at one of the many theatres around Luxembourg, attending or participating in poetry or play readings at the European Foyer, listening to or taking part in radio plays, musical, or song sessions, to LEAPA-sponsored Murder Mystery dinner events, theatre-related classes, and similar activities. Members benefit from discounted theatre tickets, quiz nights, workshops, playwriting and poetry competitions, talent-sharing, concerts, etc. Our mission is to promote, share, and enjoy the performing arts in Luxembourg. We are actively growing our membership so even more people – all equally interested in the performing arts – can participate in our fun and exciting events and activities. We are enthusiastic, full of ideas for new and interesting events, and excited about meeting new people and increasing our membership! Please feel free to like us on Facebook. We hope that you will join us so you can enjoy the performing arts with like-minded people from around the globe!